Its great having the computer next to the radios. 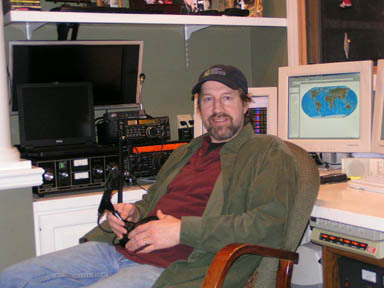 The internet has become a big suport tool for Ham Radio. Having multiple monitors allows me to have several programs open and running in their own screen. 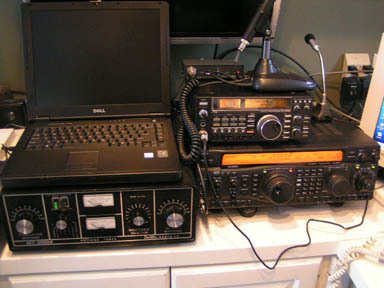 The radios at the home station are an Icom IC-275H 2 meter all mode and a Yaesu 920 for HF and 6 meter. I have a Dell laptop dedicated for PSK31 and other digital modes. 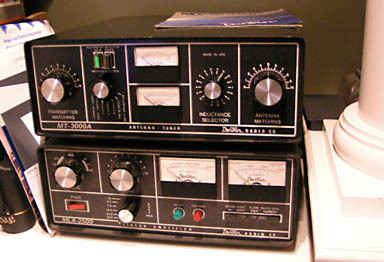 The antenna tuner is an old Dentron MT-3000A. I also have the matching Dentron MLA-2500 linear amp but I dont use it because I havn't wired the desk with 220 volts yet. I like running barefoot with just the radio anyway so there is no rush on the amp. I may never use it? I got the amp along with some other radio gear I bought from a ham that was relocating into a condo. I found the matching tuner on ebay and figured I better snap it up so I could have the matched set.